And that is teach a neural network something new. It’s almost like there’s neural choreography. And so this experiment begun. The common wisdom was to no avail. So if you want to teach the neurons set them free. Now they’re silent, so they aren’t such a drag. The new and old memories stayed. Without disrupting the others, the method is clean. If your computer used a living chip? The Coalition for National Science Funding (CNSF) Exhibit was held on Tuesday, June 26, 2007 at the Rayburn Building. This gathering provided the interns the opportunity to mingle with people from the National Science Foundation (NSF) and some congressional staff members. The purpose of the exhibit is to thank NSF for their funds and show Congress that these funds are contributing to the advancement of science, mathematics and engineering related fields. Many exhibitors were present to talk about their research. Topics varied from biology, geology, psychology, engineering, mathematics, ecology, and cosmology, just to name a few. This was a good time for interns to talk to people from other universities with different field interests. The night ended with dinner at Capitol City Brewery restaurant with Fred Dylla, the Executive Director and CEO of the American Institute of Physics, his wife Linda, Jack Hehn, Jerry Hobbs, and Liz Dart Caron. This was a nice change of scenery to visit with our bosses outside of the work environment. We have 5 summer interns in the building right now (great for morale and new ideas!) Recently they took some demos to a local school and the big finale was a mentos and diet coke car. You can watch their demo below. Anyone else sensing a new fuel alternative??? The mentos and diet coke experiment became a huge hit thanks to a couple of guys from Maine who recreated the Bellagio Fountains. Not only is the reaction a spectacular sight, it's a great testament to the cool science you can do with common items. One of the best parts about YouTube is scanning through viewer comments - especially in regard to science-related videos like Leaping Shampoo. In this case the comments range from completely missing the point ("they used the Microsoft startup music") to the classy ("GREAT excuse to bring﻿ girls in the tub"). One comment simply read, "The last time I checked, there is still no cure for﻿ cancer." boboelmo is right of course, there is still no "cure" for cancer. Just the other night I called my mom and she answered from the ER. She was sitting with a good friend whose legendary sense of humor is drifting away with her strength as she is beaten down by chemo. Why on earth would you invest time, money and brain power into studying how shampoo pours when they could be invested in saving lives? I feel compelled to respond though, probably because I need to reassure myself that what I and my colleagues do is worthwhile. So, boboelmo, here is why I appreciate Falling Shampoo and all it represents. Check out the story Masters of Improv from Symmetry Magazine to read about the importance of aspirin and coke cans in experimental particle physics. By nature scientists are creative and curious people who, like artists, should be given reign to explore their ideas. See Female Science Professor's post on Science and Creativity and Relativity for more. ...bubbles and jets in multiphase flow phenomena such as air entrainment, sonoluminescence and cavitation. I am particularly interested in the physics of muliphase flows found in biomedical applications and in biological systems and in the physics of bubbles and jets in granular flow. It appears that he is not just some "dumbass" who thought "I want to pour shampoo out of a bottle." But even if he was - it's still a cool video. Physicists link a real pendulum to a virtual one in world's first mixed reality experiment. People have been linking their identities with online pseudonyms since the beginning of the Internet. Games such as World of Warcraft and Second Life make these identities more tangible, allowing players to create digital avatars to represent themselves. Avatars can take actions, construct and destroy virtual objects, trade with currency, and travel through virtual worlds in addition to exchanging ideas verbally. Interactions among avatars become more real as headsets allow players to hear other human voices in addition to seeing an animated representation of the person. We all know that the actions of real people control virtual realities, but a recent experiment has shown that a virtual world can affect objects in the material world. Vadas Gintautas and Alfred Hübler of the Center for Complex Systems Research at the University of Illinois have been linking the real world a virtual one using that classic physics device, the pendulum. In fact, they just published an article about it in Physical Review E.
While most players enhance or completely transform their appearance when they create an online avatar, Gintautas and Hübler tried to create a virtual pendulum that closely resembled their real one. They put the two pendulums into communication. The details of this communication are a bit complex, so brace yourself for some vocab. The fixed point is the point from which a pendulum hangs. Don’t be fooled by the word “fixed” – this thing moves around. The angle of the pendulum’s swing is measured as it rotates around this point, and zero means it hangs straight down. Last but not least, the natural frequency of the pendulum is the rate at which it prefers to swing. That said, the fixed point of the virtual pendulum moves depending on the angle of the real pendulum. Likewise, the angle of the virtual pendulum determines the location of the fixed point of the real pendulum. Moving the fixed point of a pendulum is a method of driving it. When Gintautas and Hübler made the virtual pendulum, they programmed friction into the system. When the real and virtual pendulums don’t connect, it’s called dual reality. Friction drags them to a stop. When mixed reality occurs, the two pendulums drive one another. Moving as one, they defy the friction forces that would ordinarily halt their swinging. Mixed reality only occurs when the two pendulums have comparable natural frequencies. It is possible for a real pendulum to become one with its virtual identity, but mixed reality cannot happen with real people and their avatars. While the players exert full control over their online identities, the avatars don’t significantly influence their players. This is probably fortunate for Warcraft players who would prefer not to die with their characters. Even so, mixed reality may actually prove useful in the real world because it can occur only when the two systems are sufficiently similar. A system with unknown parameters may be synced up to a virtual system whose parameters are set by physicists. The unknown factors in the real system can be determined by changing the virtual system until they shift from dual reality to mixed reality. Then, the physicists will have good estimates for the values of the unknown parameters. 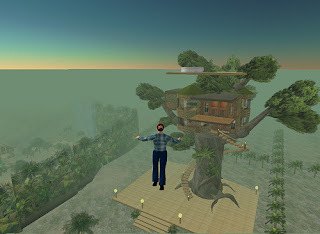 Second Life real estate that players can purchase with their virtual money. Apart from human identities, World of Warcraft and Second Life intersect the material world economically. US dollars may be used to buy both Second Life linden dollars and Warcraft gold (although, you have to buy gold from other players through sites like Peons4Hire). In the case of the coupled economies, transfers go both ways. Gintautas and Hübler are curious about the possibility of mixed realities emerging from these coupled economies. After all, if two synced pendulums could overcome friction forces, perhaps synced economies could escape recession. In honor of the recent Father's Day, I'm posting about a debate I once had in the car with my dad. We were talking about shadows and dimensions. Okay, so this is more math, but if you like physics, you must at least have some appreciation for the power of math. Dad believes that a four-dimensional object could cast a three-dimensional shadow. I was convinced that all shadows must be two dimensional. 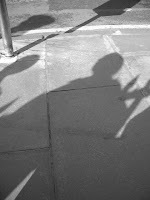 In my mind, a shadow is just a two-dimensional map of places where light has passed by or been obstructed by an object. So it must be two dimensional. Wikipedia says that I'm just talking about the cross section of a shadow -- they're all essentially three-dimensional. It's hard to imagine a four-dimensional object, though. If I was better at math, maybe I could say something about how photons would interact with it, but I don't have much of a conceptual idea. Some folks at Union College of New York who are better at math made short animations of the shadows of rotating cubes (3D) and hypercubes (4D, projected in 2D for the picture). In the animation, each face of the hypercube casts a three-dimensional shadow. So I guess the math supports my dad. It's really hard to argue with math. But if you have an opinion on the matter, I'd love to read it. Four SPS interns went to Ms. Coffman's Third Grade Class at Tuckahoe Elementary School on Tuesday, June 19, 2007, for a physics demonstration. Our main topic was speed vs. height using skateboards, a homemade ramp, and boxes. We provided the materials, including Hot Wheels Radar Guns! The kids measured the maximum speed on the skateboard as it traveled down the ramp at an increasing height. We collected data for a height up to four boxes and then plotted our results. The kids caught on really fast and tried to convince us to let them ride down the ramp on the skateboard to see how fast they could go! Then, we tied in a safety demo about speed, seatbelts, and bodily damage. The kids made their own Playdoh dolls and took turns sitting them on the skateboard in one of three seats. The first seat had a lap belt and shoulder strap, the middle seat had only a lap belt, and the last one had nothing. The damage assessment was based on tears, loss of limbs, and flying from the car. This was a really big hit with the kids as they determined who suffered the most damage. After all of the data was plotted, we compared graphs, discussed potential energy vs. kinetic energy, and ways to improve the experiments. The students were very excited about the whole concept and did not seem to realize that they were learning a valuable safety lesson along the way! For the grand finale, we attempted to launch a couple of Diet Coke and Mentos rockets on skates. One rocket was weighted down with a water bottle, and the kids were encouraged to predict the outcome. The rockets did not travel as far or as smoothly as we would have liked, but the spewing soda was impressive to the students. Justin and Ryan's hard work paid off that morning. Besides being informative and exciting, the demo was also a test run for a potential SPS SOCKS experiment. It was a definite success at showing students how to practice proper safety techniques when riding in the car at Hot Wheels Speed! That's right, we're starting a podcast. It's so new it doesn't even have intro/ending music (we boycott the term "outro"). So have a listen. It's about ocean waves, bubbles, sound, and global warming. All that in a minute and thirty-two seconds! If you want to read more, check out the lay-person's version of Deane and Stokes' paper from the 153rd meeting of the Acoustical Society of America. Since 1929. On the whole I try to stay out of global warming discussions because I'm not well informed about it and don't have much to offer. With that preamble, let me bring up this comment by Vaclav Klaus, President of the Czech Republic. Those are some strong words! What is best for the earth (a constantly evolving and changing entity) may not always be what is best for society (as we know it today). Hmm...now what does that mean??? "Since Sunday, one of the two channels on Natalie Meilinger's baby monitor has been picking up black-and-white video from inside the space shuttle Atlantis. The other still lets her keep an eye on her baby." "Physicists of the DZero experiment at the Department of Energy's Fermi National Accelerator Laboratory have discovered a new heavy particle...approximately six times the proton mass." "The first liquid camera lens with no moving parts, and that can switch between two levels of magnification, has been designed by a German research team..."
"Teixeira is one of a growing number of fuel-it-yourselfers -- backyard brewers who recycle restaurant grease or make moonshine for their car tanks. They do it to save money, reduce pollution or thumb their noses at oil sheiks." "The apparently passive garden plant is not as easy-going as people assume, at least not with strangers. Researchers at McMaster University have found that plants become competitive when forced to share a pot with strangers of the same species, but they are more friendly when potted with their siblings." "'This really confirms that there was an ocean on Mars,' said Mark Richards, a planetary scientist at the University of California at Berkeley and co-author of the study..."
I'm a fan of origami. Call me simple-minded, but there is something satisfying about starting with a flat square of paper and ending up with an adorable stocking (they made great gift tags!) or a pretty flower. But origami isn't just for stockings and flowers anymore. NASA scientists have recently joined a Tokyo Metropolitan University group in working on an origami-based method for unrolling tethers in space. Tethers are used in space like child harnesses are used at amusement parks - they keep a child (satellite) in orbit around the parent (space shuttle), no matter what direction the child tries to go in. The Japanese team has designed a deployer that uses reverse origami - the tether starts out folded and unfolds into a nearly straight line as the top is pulled. At least that's the theory. There are many details left to work out before the deployer is launched in a proof of concept experiment (set for 2009). In addition to the details of the deployment method, there is some interesting physics that needs to be worked out. NASA researchers were brought in specifically to help the Japanese team figure out how the tether will respond to the Earth's magnetic field (since moving a wire in a magnetic field creates current). They're also investigating how to use the tether for propulsion. I came across the trailer for the Big Bang Theory sitcom today. Looks worse than I expected. Big Bang Theory was one of the most highly sought-after comedies at this year's LA Screenings, and we are excited to be partnering with C4 in the UK for the premiere of this funny and insightful mass-appeal series that will play to all demographics. Get working on your cheesy rhymes because there may be a new market for jingle writers soon. We are interested in scaling the technology down to produce interactive packaging for products like chocolates. The boards are created in three layers - a base made from sturdy cardboard, a middle layer screen-printed with conductive ink, and a top layer printed with the billboard design. All of the information is digitally embedded in the paper and the touch sensors and speakers are printed directly on the middle layer. The middle layer is connected to a power supply and some microelectronics which enable the user to play, pause, and rewind the sounds as shown in the video. I think this is great stuff. I am seriously worried, though, that if this technology becomes common every time my roommate pours food for her cat I'll have to hear the meow mix. If you take carbon atoms and arrange a sheet of them in a hexagonal pattern, you’ll make graphite. If you intersperse your hexagons with pentagons, much like a soccer ball, you’ll make a hollow sphere known as a buckyball. The shape requires 60 carbon atoms, hence the symbol C60. 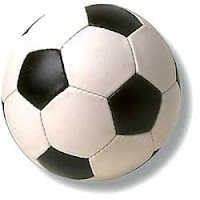 First time I ever heard that term was from an Australian physics professor, and I thought it was an Aussie term for a soccer ball…turns out the molecule is named for Richard Buckminster Fuller, discoverer of hollow carbon microstructures known as fullerenes. 7Be is a radioactive isotope of beryllium. Radioactive nuclei decay by catching or releasing particles and becoming other nuclei in the process. 7Be decays by snatching one of its orbiting electrons, transforming one of its protons into a neutron. Then it is 7Li, a stable isotope of lithium. Among other 7Be atoms, a sample of 7Be needs about 53.3 days for half of it to become 7Li. Inside a buckyball cage, this half-life is only 52.5 days. It should be noted that the half-life for 7Be alone was taken at room temperature while the trapped 7Be was measured at about -450°F (-268°C if you’re outside the US and 5K if you’re savvy). In any case, the trapped beryllium was pretty darn cold, only slightly warmer than absolute zero. At first, I wondered if the temperature difference accounted for the difference in half-lives. However, it seems that the half-life of the cold 7Be should be longer than its warm counterpart, not shorter. Feel free to share your thoughts. As interesting as this half-life business is, what really drew me to this research was the question how did they get a beryllium-7 atom into a buckyball?. Apparently it just walks right in and doesn’t walk back out again. There was also mention of an electron changing hands (from the beryllium to the buckyball), so perhaps that’s enough to keep the beryllium inside. I’ll be sure to update if I get a better explanation. a T Ohtsuki et al. “Radioactive decay speed-up at T=5K: The electron-capture decay rate of 7Be encapsulated in C60.” Submitted to Physical Review Letters. b T. Ohtsuki et al., Phys. Rev. Lett. 77, 3522 (1996). ...Buckminster. It must have been awful for him, back in the third grade. As we speak (well, I write and you read), Salt Lake City is buzzing with acoustical news. It's home to one of this year's Acoustical Society of America meetings. The meeting covers topics from What Did Dinosaurs Hear? to a Workspace Speech Privacy Calculator. And where else can you hear legitimate scientific talks titled Is a Neolithic Burial Chamber Different from My Bathroom? and Life's a Pitch? Science Daily had an interesting story, cleverly titled A Sound Way to Turn Heat into Electricity, about some research that will be presented at the meeting tomorrow. This research surrounds using sound to turn waste heat into electricity. The University of Utah physicists use hot, moving air to produce sound in a small resonator. The sound waves then squeeze a piezoelectric device, and shazam- you have electricity. The Army is interested in this work because they could use the technology to make use of waste heat from radars and to create portable electrical energy generators that could power electronics on the battlefield. You can imagine how else it might be useful - Dr. Orest Symko, the lead researcher, thinks the technology could make efficient cooling systems for computers and generate electricity from the heat give off by nuclear power plant cooling towers. Hello, I am an amateur blogger so here I go! My name is Meagan and I am from Houston, Texas. I am a senior at Angelo State University in San Angelo, Texas, Home of the Running Rams! I am the 2007 APS Physics Quest Intern. I hope to share some of my interesting findings along the way!